When I was about 12 years old, I began tinkering with outboards. Now nearing 60, you would think I would have owned every outboard I ever wanted and a fair number of ones I never knew I wanted. But it seems there is always another outboard that captures my interest. Lately it's Buccaneers and early QD Johnson's. My collection is primarily from the 1950's and everything I have is complete and ready to run. The magic number of motors on the racks seems to hover around 50. The best advice I can share about working on outboards is cleanliness, attention to detail and not getting stingy with the oil mix. If I had to sell all my motors and pick one to keep, it would have to be my 58 Evinrude Fastwin. 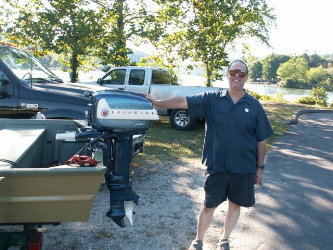 It is a nice looking outboard, dependable and the motor I have owned the longest. I'm a fairly new member since 2003. My real passion for outboards came when I was a kid running the ole 53 lightwin in the garbage can and my older brother teaching me up in Maine to take the helm. I still have that motor and two more lightwins probably a total of 30 motors from a 28 A-35 to a 5.5 golden jubilee. I did acquire by rare luck a 28 Elto Quad which hasn't come to real life yet but is fun to look at in the basement. 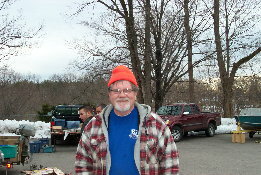 I do love the swap meets and am going to miss Bill's and Walt's. I have learned a tremendous amount since being a member and a special thanks to Ray S. for letting me know about the club. 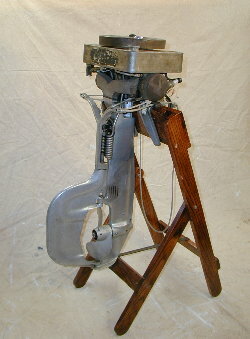 I am interested in all outboards from the teens and 1920's through the 1950's. I have a particular interest in "oddball" outboards like Bendix, Flambeau, Lauson and others. You can see highlights of my outboards on my website www.oddjobmotors.com. 1926 Elto "Super G" Ruddertwin 4hp - one of Art's favorites!